The enzyme galactose-1-P-uridyltransferase (Gt), which exhibits a genetic polymorphism, has an important function in the galactose metabolism. Its clinical importance is due to the fact, that the different gene products have different specific enzyme activities, which leads in the case of homozygosity for the null allele to galactosemia (Gt 0–0). Other forms with reduced activities, like the heterozygosity of the Duarte-variant with the null allele (Gt 2–0) are clinically significant as well (Schwarz et al, 1982). 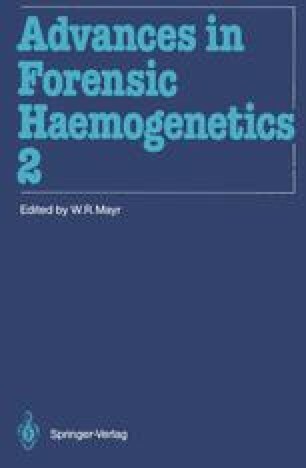 On the other hand, the Gt polymorphism has found routine application in forensic hemogenetics.